Welcome to LOVE LIVES USA, a not-for-profit initiative for spreading positive, public messages through billboard signs across America. 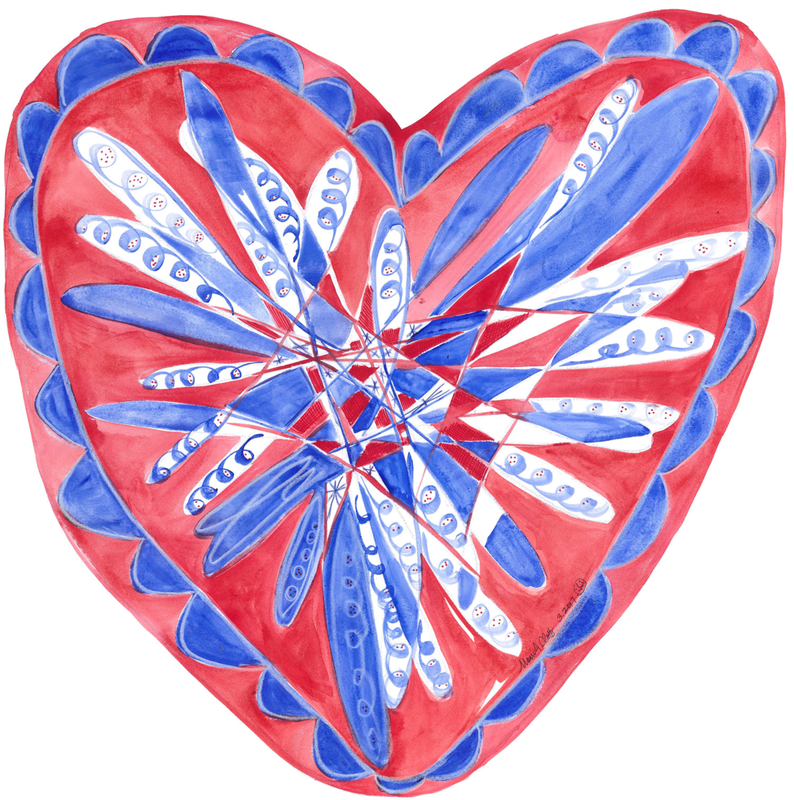 Compelled to create beauty for unity, artist Maureen Claffy hopes her work inspires a movement. 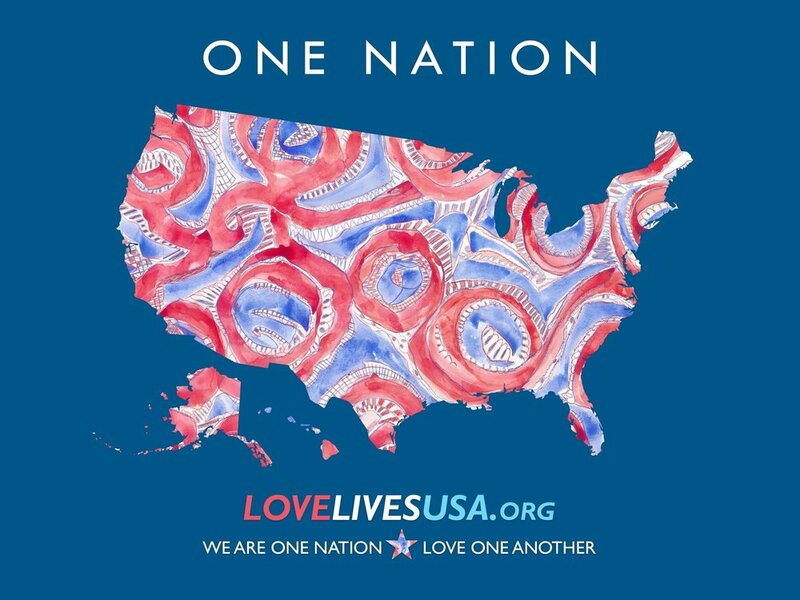 July 2nd, 3rd, 4th and 5th, Love Lives USA will have Billboards honoring American and our mission for One Nation of love across the country! a nation deeply in need of love. Only love can bring us together, make our path straight, and restore the American dream. Please join us today by making a Go Fund Me Donation. Your donation will sponsor billboards across the nation that declare that Love Lives in the USA using the images above. In addition, yard signs to display showing your support and encouraging all to spread LOVE can be purchased by the box of 25 directly from Tom Auge - please email tauge@allegrampm.com. A box of 25 double faced signs is $315 plus shipping. "As I was painting with red and blue on white paper all Winter 2017, I was struck by the power and the iconic nature of the colors. Red as in blood of patriots, Blue as in ink and the written rule of law. I kept thinking about the American Revolution. There was no way to separate red and blue in the paintings. They were bound together. The idea of Red and Blue states is folly because we stand or fall as a Nation as one." 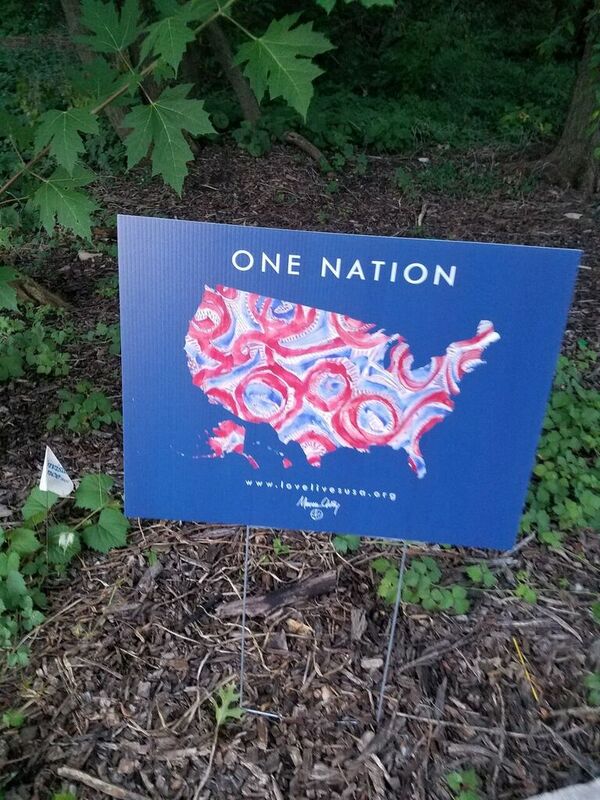 We are One Nation, no matter whether we are red or blue. "The tone and tenor of last year's presidential election inspired Claffy and these images, which are all part of her America The Beautiful Series. She said she found the election's language uncivil, unsafe and sometimes offensive. She was part of the women's march that took place after the presidential inauguration this year, and afterward she said she felt "that there was all this energy and what are we going to do with it." 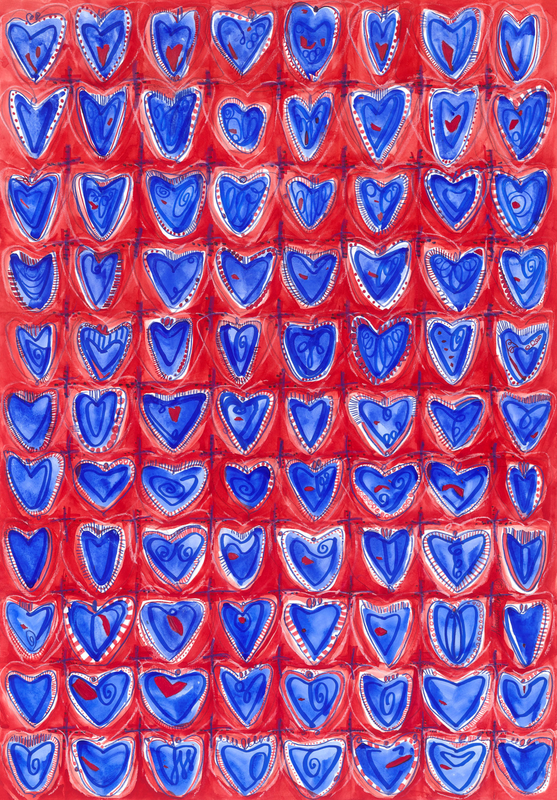 She expressed her concern and her energy in the way that she knows how: through painting. Claffy collaborated with other village women, specifically Nancy Pollak, Ramsey Ellis and Mandy Roudebush to come up with a message: Love Lives Here. Claffy was struck by the boldness of that statement and also by the rightness of it. She would like to see us all love one another and insists on love and respect in the way that we treat one another despite differences." 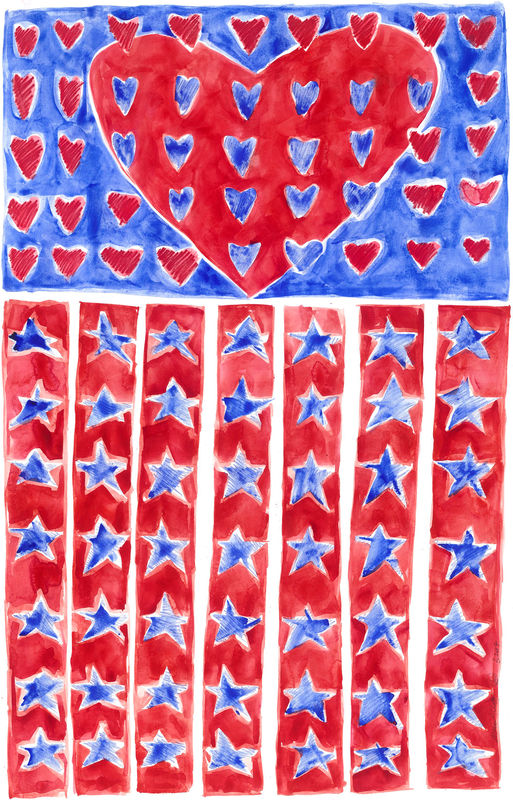 LOVE LIVES USA was born and the project's first initiative was the creation of Yard and Window Art Signs featuring Claffy's "America the Beautiful" painting series. Orders flew in from the women of After the March and on the July 4th weekend, proceeds were used to purchase billboards across Chicagoland carrying messages of love & unity. For Independence Day 2018, more billboards were purchased in Chicago, but also in Denver, Colorado and Casper, Wyoming! 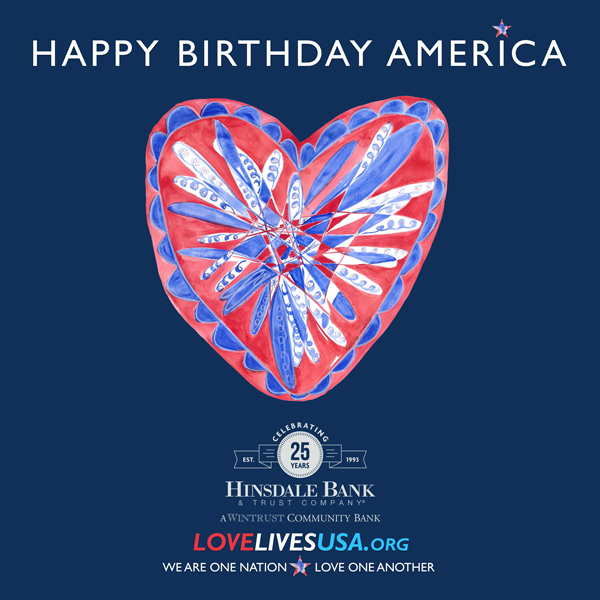 LOVE LIVES USA wants to take our message of Love coast to coast! Look at all of the potential billboards waiting to spread love and positivity all around our great nation. Donate via our Go Fund Me page to sponsor the billboard nearest you! We cannot wait until all of those dots are replaced with LOVE LIVES USA stars! Just in time for the Summer Holidays 2018, we'll introduce LOVE LIVES USA Cards that you can purchase on amazon.com to send Love to friends and family. Proceeds will go towards continuing to spread our message of LOVE. We wish 2018 to be the year of Love! Please Like, Follow, Donate, and Spread the Word!